The new USS Little Rock is one of the Navy’s newest warships. It was built in Marinette, Wisconsin and is a Littoral Combat Ship (LCS) that will operate in waters close to the shore. The vessel also has a helicopter pad, a ramp for small boats and can be used by small assault forces. The original USS Little Rock began its service as a light cruiser when World War II was coming to an end in 1945. It was officially decommissioned in 1949 and recommissioned in 1960 as a guided missile cruiser, before being taken out of service in 1976 and brought to Buffalo. 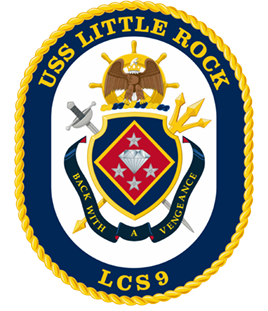 The name of the original USS Little Rock and the new vessel both pay tribute to Arkansas’ state capital. In her role, the USS Little Rock will play an important role in the new fleet of warships that will carry out our nation’s future maritime strategy. Over 100 miles of electrical and fiber optic cable. 1,000 tons of aluminum, 2,000 tons of steel. CVN 68 Class Aircraft Carrier: approximately 3 horsepower per ton.